In early December 2018, Governor Michael Dukakis, Chairman of Boston Global Forum (BGF) and Michael Dukakis Institute for Leadership and Innovation (MDI), co-founder of the AIWS Initiative, emphasized our responsibility in creating a better world using AI. He made an opening speech at the AI World Conference and Expo. MDI is collaborating with AI World to publish some reports and programs on AI-Government, including AIWS Index and AIWS Products. It is a valuable opportunity for leaders and executives who seek knowledge of innovative implementations of AI in the enterprise through case studies and peer networking. 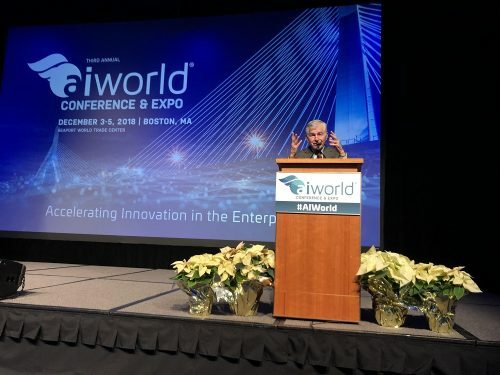 And at the AI World Conference and Expo 2018 launched by AI World, Governor Michael Dukakis, Chairman of BGF and MDI, made an honorary opening speech. The opening remarks highlighted the human’s mission in developing and creating AI to make our future brighter. At the conference, he also introduced the AIWS Report on ethics practice of major governments in the field of AI, including G7 countries and EU. According to Eliot Weinman, GM & Founder of AI World, and Executive Editor of AI Trends, “Former Governor Michael Dukakis has been an innovative global visionary for decades. For the past several years BGF has conferred with government, research and technology experts to develop a framework for governments around the world to develop the proper AI ethics regulations. As a result, this morning, the Boston Global Forum released its AI World Society Report on AI Ethics, which includes its Government AIWS Ethics and Practices Index”. He also looks forward to cooperating with BGF and MDI in the next joint event AI World Government Conference & Expo held in 2019.